Jesska Denise: House of Holland False Nails. House of Holland False Nails. 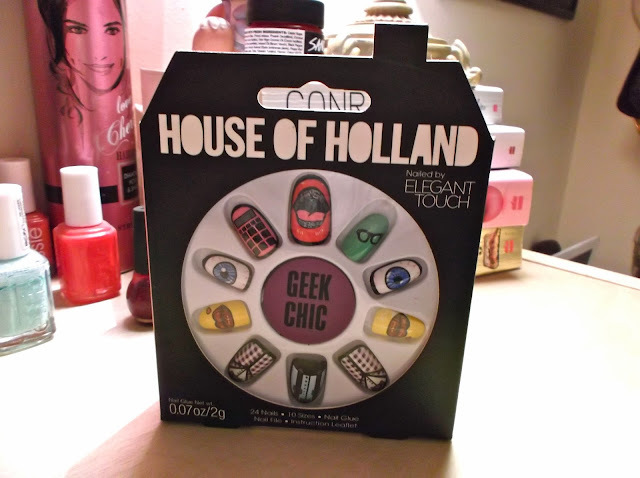 I don't think I've ever been more willing to pay 10€ for a pack of false nails than I was for these 'House of Holland' by Elegant Touch ones. When I saw them on the rail in Boots I practically jumped for them and then convinced my friend that she also needed them. She was able to buy them using her Boots advantage points, she wins. LOOK, the packaging is a little house. Attention to detail or what. 'House of Holland' its a house? okay I'll stop now. I did contemplate buying the 'Dotty' ones cause I was loving the matte black but these were so Geek Chic that I couldn't resist. They screamed Zooey Deschanel to me and everyone should be a little more like Zooey Deschanel. I've been a massive fan of Henry Holland since way back in the day when he hosted 'Frock Me' with Alexa Chung on Channel 4. The ultimate duo. 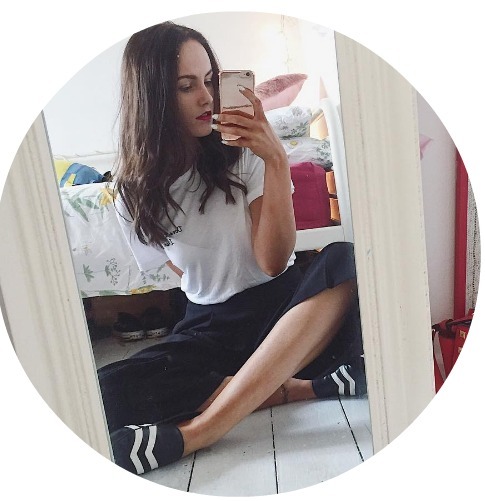 I was slightly obsessed with the 'House of Holland' slogan tshirts and spent many hours scrolling through the 'House of Holland' website. Maybe too many hours. If anything he is the definition of geek chic. Too cool for his own good and part of that british fashion crew. You know the one. The nails come in their own little black house and contain 24 nails in 10 different sizes. I'll never get use out of the eyes in the middle as they're absolutely massive and I can't imagine someone having fingernails that big but if they're in the pack there's obviously a need somewhere. The inside of the pack contains everything you would need to apply your nails perfectly. As I'm still a bit of a rookie when it comes to false nails, my friend advised me to file down the corners of my own nails to reduce any risk of the false nails falling off and to apply the glue to every inch of my nail. The glue dried almost instantly (my thumb was nearly stuck to my middle finger for eternity) and the nails held as though they were there all along. On the box it promises that they'll last for up to 10 days. Despite my best efforts to keep them on for as long as possible to see if this was true, I had to yank them all off two days later for work. But they did last a whole 48hrs which is pretty good by my standards. 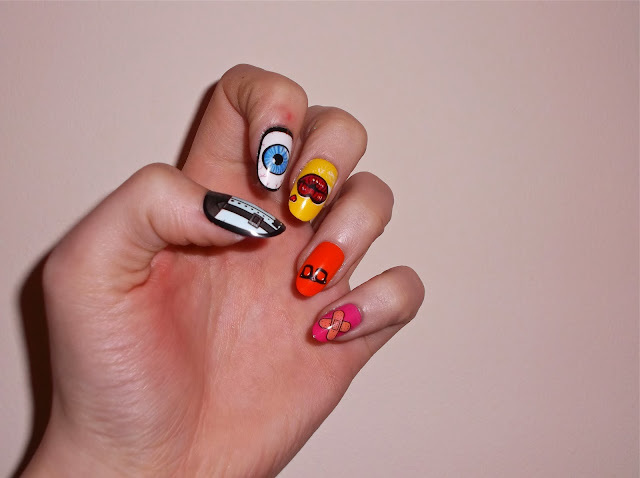 The designs on the nails are just so cool. My personal fave is the suspenders one on the thumb, closely followed by the creepy looking eye. So if you're a false nails rookie like myself and you're on the lookout for a pack that's hassle free with zero to no filing necessary then these are for you. Granted, at 10€ they are at the pricier end of the scale but well worth it if you ask me. Also, lets take a moment to cherish the fact that Henry Holland liked the pic of my nails on instagram. My inner fangirl died a little when she saw.. I keep seeing the Henry Holland nails and I really want to pick up a pack. I adore the designs of these, so unique compared to most false nails and they don't look like your 'typical' faslies! I had seen these in boots, they look very cool but they are quite long!